What is the best part of writing for a food blog? One might think it's the recognition and fame. Having people stop me in the supermarket to get me to sign an autograph for them. 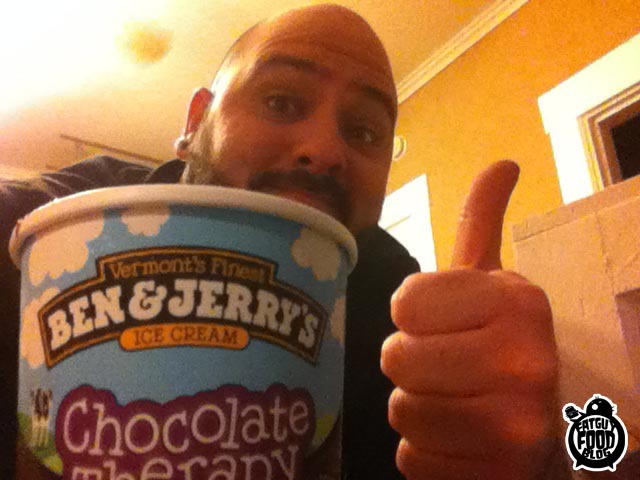 "Hey man, I really enjoyed your last Ben & Jerrys's review, it really spoke to me." I smile, kiss their baby, and I'm on my way. You might think this is the best part. But it's not. The best part is when you get stuff in the mail to review. 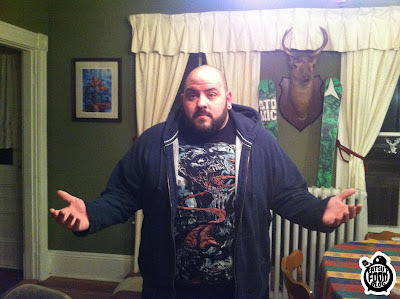 Some days you come home and there is a package, post marked to THE FATGUYFOODBLOG HEADQUARTERS. We tear them open like a child on Christmas day, arms raised to the sky, rejoicing. Those are the best days. 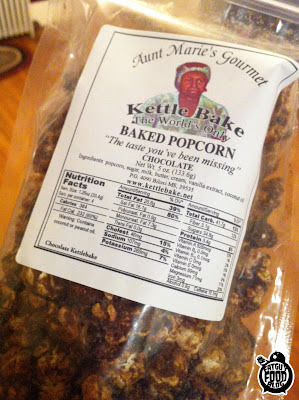 We had one recently when we received a box from Aunt Marie's Gourmet Kettle Bake popcorn. Irwin got to the package before we did. Inside were the two premiere flavors, Chocolate and Praline. 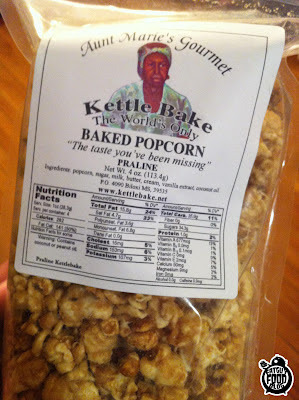 The package let's you know that this is THE WORLD'S ONLY BAKED POPCORN. The more I thought of it, I've never heard of baked popcorn, so that is probably true. I figured this was true also because of how serious the woman on the bag looks. She doesn't seem like someone who would steer me wrong. I'm guessing she is the Aunt Marie in question, creator of the baked popcorn phenomenon. 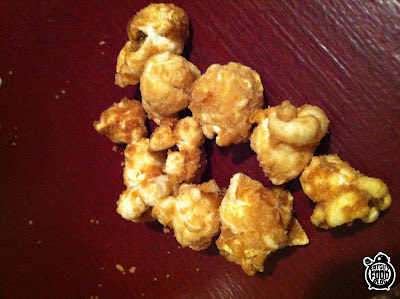 Originally I had thought that the popcorn was maybe baked in an oven, because of the name. But some research on their website made me realize that it's popped and then the flavor concoctions are then applied and baked into the corn after. First up was the Praline flavor. It was quite delicious. It has a sweet, almost vanilla flavor. It's very different from regular flavored popcorn though. It must be the baking process because it's not coated in powder and it's not a glaze. It's somewhere in between. It's very unique. 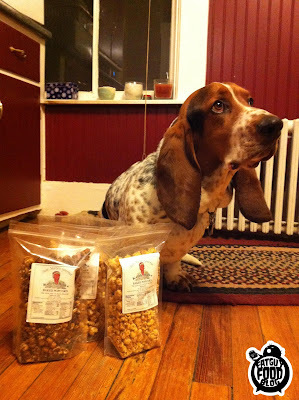 Unlike any other popcorn I've ever had, and Jack, I've had my fair share of popcorn and more. Every bite bursts with sweet flavor. The color made me think toffee but the flavor seems to be somewhere between that and caramel. 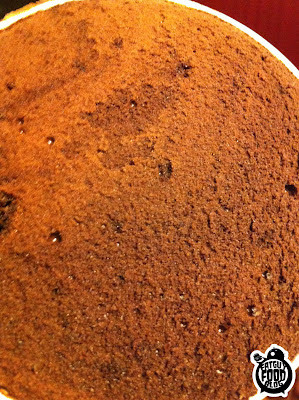 Next up was the chocolate flavor. Right from the get go you can take a look at it and know it's going to be intense, just judging from the color and how much chocolate it has on it. One thing is for sure, Aunt Marie didn't skimp on the flavor. The chocolate flavor was kind of like Cocoa Puffs. Mixed with popcorn. How could that be bad? It's like some snack wizard waved his staff through the air and married his two favorite snacks into one. Again, it's not quite a glaze, but also not quite a powder. It's somewhere in between. But still absolutely delicious. 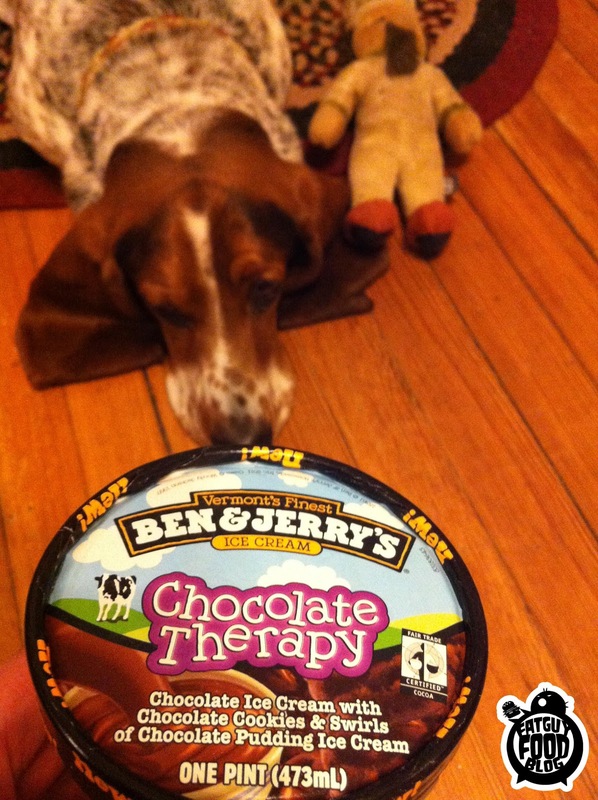 I give both the Praline & Chocolate flavors an A! GET READY TO PUKE: It's Cumberland Farms Soda! As a child growing up grabbing 3 liter pineapple soda's from my local Cumberland Farms, riding hands free on my mountain bike, clutching a hefty 64oz fountain drink as a way to celebrate a job well done on my paper route, I am in no way unaccustomed to cheap soda. CF has seen fit to throw it's hat into the 20oz bottled soda biz and give us these two fine concoctions, Cotton Candy Commander, and Strawberry Monkey. There were a few others there but these seemed the most appealing to my little fat sweet teeth. all I could choke down from these wretched offerings! As you can tell from the post title, I didn't like either of them, so here's a quick run down of both of the flavors. Cotton Candy Commander: Has a solid grasp on what cotton candy tastes like, and i do have to say, it's not THAT bad, but the worst thing about it is that after the first mouthful of liquid sugar, every tooth you have in your head begins to throb with pain, each one crying out as to why you'd wash this sweet tasting blue poison over their little white bodies. Strawberry Monkey: there's never a good fake strawberry flavor, it's like the lab tech boys at CF when trying to brew up this horror had never tried a strawberry once in their lives, nor did the people that taste tested it. the only reason it's so aptly named "strawberry monkey" because whatever cancer inducing chemicals they decided to dye this non potable horror water with happens to be red. the blood of dead monkeys swirled into a nest of carbonated chemical bath. The worst part of Strawberry Monkey happens to be the after taste. I really have no clue what it is, but after you swallow down a load of hot strawberry monkey, you instantly want to get the flavor out of your mouth by any means necessary. from this so called "farm"
Back when I did the review for the Ben & Jerry's Chocolate Nougat Crunch Ice cream, I told the tale of choosing that one over the Chocolate Therapy flavor. When I realized the error of my ways and went back to find it a day later, they were sold out. So my search blossomed into the ice cream version of a full scale man-hunt. I checked every gas station, residence, warehouse, farm house, hen house, out house and dog house in my area. Finally, I found it. Irwin couldn't have cared less. So how is it? Well...it's weird. Let me start with this, IT IS DELICIOUS. But it's also weird. It honestly doesn't seem like it's ice cream. I know, I know, that makes zero sense. But it's true. 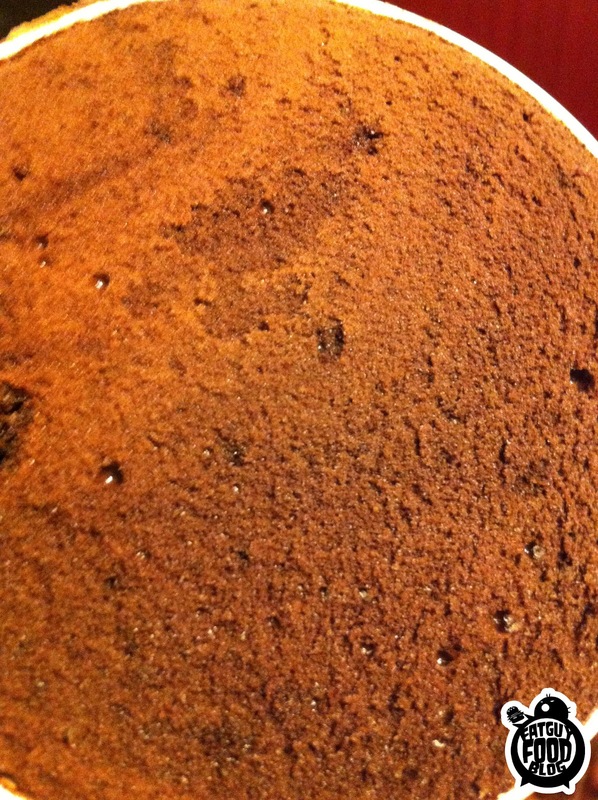 Looks almost like the surface of a Chocolate planet. Ben and Jerry tell you that this ice cream is: Chocolate Ice Cream with Chocolate Cookies & Swirls of Chocolate Pudding Ice Cream. That sounds like an overload of chocolate that a human being might not be able to handle. Here's the thing though, it doesn't taste like all of those things at all. It tastes more like someone was baking a batch of brownies and then at the last minute decided to freeze the batter. 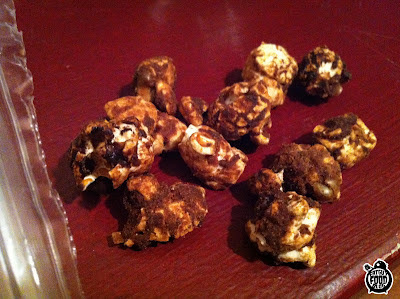 But right before they toss it in the freezer, they mix in some pudding and a few chocolate chips for good measure. There was no time when I was eating this that I ever took a bite and tasted "ICE CREAM", not even close. It's like a big mess of frozen chocolate STUFF. But it's damn good. I could have demolished this entire pint in no time flat, if it wasn't for my Green Lantern-like willpower. I put the pint back in the freezer and went back to it the next day, to be sure my taste buds were really tasting something this crazy with chocolate and it wasn't just some sort of fever dream. So if you're looking for a really good ice cream, for it's ice cream, this isn't what you want. But if you want something that is gross with chocolate, something that is going to make you say something out loud about how delicious it is, and then keep spooning it into your face non-stop, this is for you. I give it a B+. It would have been higher, but I feel like Ben and Jerry are trying to fool you here. This is no ice cream. 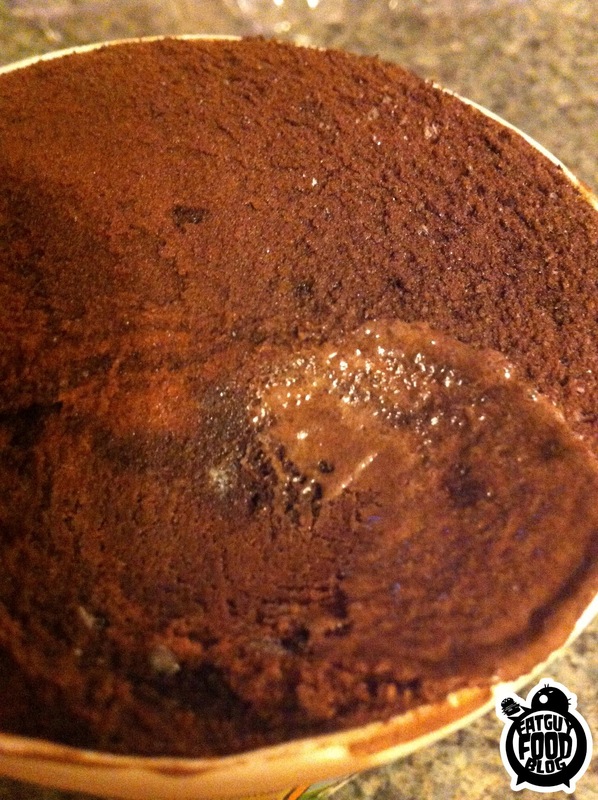 It should be called CONTAINER OF DELICIOUS CHOCOLATE STUFF THAT IS COLD. Or something along those lines. But I liked it! You can tell I liked it by the thumbs up I am giving. Listen up, Jack! Doritos just stepped up their game! How? 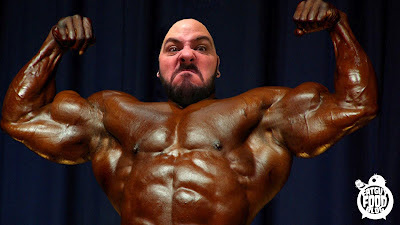 Well...they got JACKED! Three new flavors that boast on the bag that they are not only BIGGER than regular old Doritos, but they are also BOLDER AND THICKER! I know what you're saying..."Come on Fatguyfoodblog ...is it possibly that Doritos can deliver on all three of these declarations?" 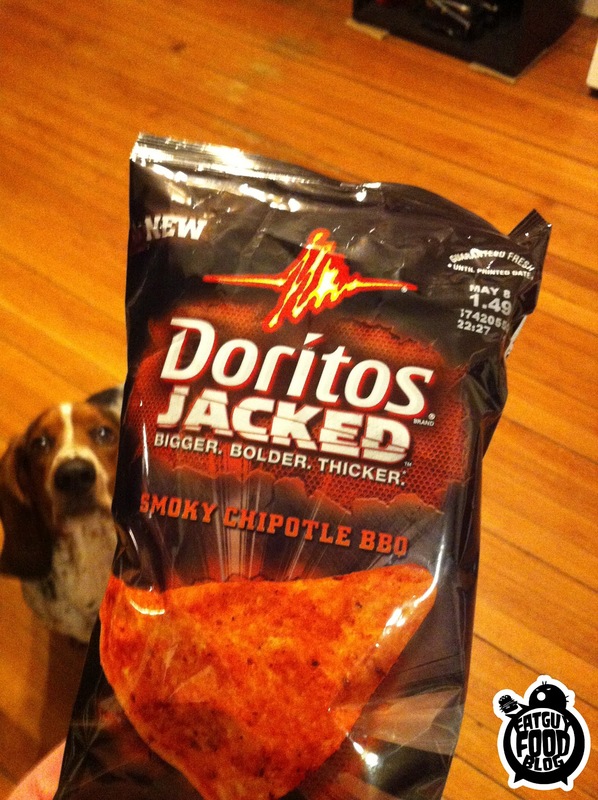 You have doubt about the Jacked Doritos...and that's why you've come here, to read the truth. Well let me tell you this...They are indeed bigger, bolder AND thicker. Makes sense now right? NOW FOR THE REVIEWS! First off is the Smoky Chipotle BBQ flavor. These have a great taste! If anyone remembers the bbq Doritos that had a limited run, these are quite like those, but with more of a bite. After three of these chips your mouth is burning pretty good. It's not a terrible burn and it definitely doesn't take away from the flavor. It's a sweet, smoky bbq. 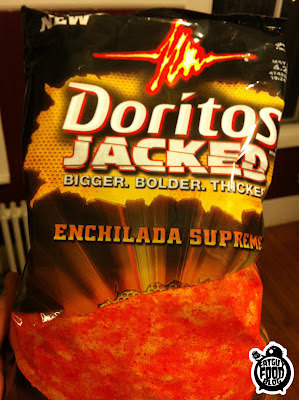 They are definitely bigger and thicker then a regular Dorito... but that's not really a good thing. They are a bit harder to eat. One chip ends up being two or three bites now. You can't just pop one in your mouth. The thickness changes the taste a bit. They almost seem more like a corn chip now. But all in all not bad. I enjoyed the small bag of these that I sampled. I did have to keep taking breaks due to the hotness, but they tasted so good that as soon as the burn would subside I came back for more. Next up is the Enchilada Supreme flavor. Same deal. Bigger. Thicker. Bolder. Bold in that they are plastered with flavor dust. The downside here is that the flavor is basically a stronger version of their taco flavor. It's a cheesy generic taco seasoning flavor. They aren't awful. 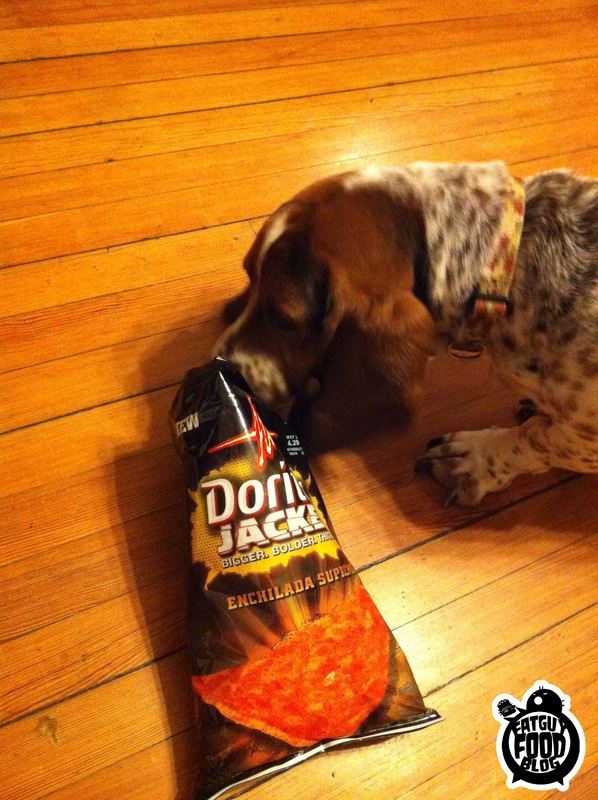 We ate a bunch of them, but there was never a time when I looked around and said, "HEY THESE CHIPS ARE FANTASTIC!" Notice the abundance of flavor dust. Irwin about to get JACKED. Ranch Dipped Hot Wings... I just imagine them being hellish. I could be wrong. They could be delicious. If anyone out there has tried these, throw a comment on this post and let us know how they are! 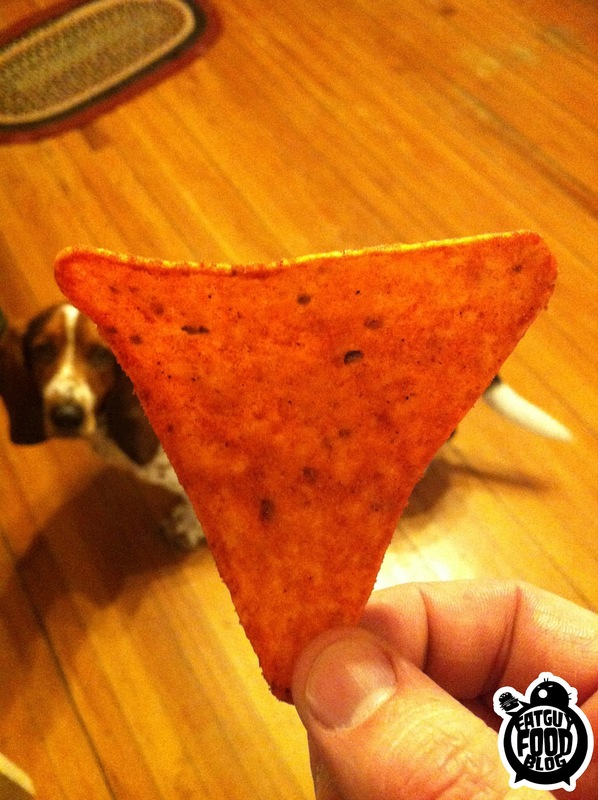 So in the end, Doritos wasn't lying. These chips are Jacked. They are bigger. They are bolder. They are thicker. 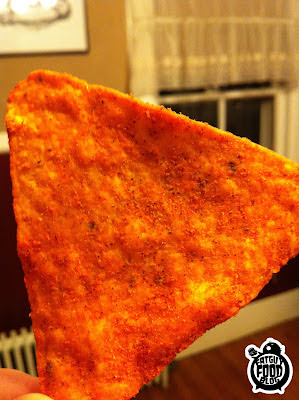 Are they better than regular Doritos? I don't think so. But they're interesting and something new. I'd say they're worth a try. If not for anything else, it's fun to yell to your buddies, "It's time to get Jacked!" As you rip open a bag.